For a long time, I was convinced there was a way to make a Tofurkey that tasted good. I just had yet to discover the right method. Maybe deep frying the whole thing or basting it in beer batter. God love the optimist in me. After multiple failed Tofurkey attempts, I was skeptical when my brother told me about Tofurkey Sausages. We’ve Rajat has been dicing them up and putting them in scrambled eggs for ages. But never used them in a real main dish for dinner. I found some beautiful, delicate tuscan kale (tuscan kale is as to regular kale as waifs are to cavemen) at the market, so when I saw this recipe from TheKitchn for Orecchiette with Sausage and Kale, I decided to take Tofurkey Sausages to the next level. Vegetarian sausages are not pretty. They do look like meat. I have no idea whether they taste like real sausage. BUT they are full of protein and spiced nicely. They make a hearty, chewy addition to regular old bowl of pasta. Also, don’t skip out on the toasted garlic breadcrumbs. They do a really good thing for an otherwise routine weeknight bowl of pasta. They are chunky and crunchy and garlicky. I made my own using stale bread in a mini food processor (see here for instructions on DIY). My processor didn’t grind them to smooth, uniform crumbs like store bought crumbs but we loved the combination of big and small pieces (which you can see in the picture). You can use any type of pasta, but I love the chewy texture of whole wheat spaghetti and the feeling that I’m eating something that’s good for me. I stirred in three-fourths of the breadcrumbs to the sausage-kale mixture and reserved the rest for topping the pasta after plating. The breadcrumbs in the sauce give the pasta a chunky texture while the ones on top retain a nice crunch, each full of garlic. 1. Make the pasta according to the instructions on the package. 2. Heat a splash of olive oil in a large skillet on medium heat. Add the breadcrumbs and sprinkle with a generous shower of garlic powder. Toast for about 3-4 minutes until the breadcrumbs are golden. Remove from skillet to a plate. 3. In the same skillet, add another splash of olive oil and the onions. Cook for about 5-8 minutes until the onions are translucent. 4. Add the mushrooms and cook for another 5-10 minutes until the mushrooms are soft. Push the onions and mushrooms to the side. Add the the sausages cook until browned, turning so both sides brown. 5. Stir in the kale and cook until wilted. 6. Lower the heat and stir in a can of crushed tomatoes. Sprinkle with Italian seasoning and crushed red pepper to taste. Cook for about 8-10 minutes so the flavors mix with the tomatoes. Add salt to taste. 7. Immediately before serving, stir in 3/4 of the breadcrumbs. Reserve the rest for topping the pasta. Serve hot over pasta and top with remaining breadcrumbs. I love the Tofurkey Italian Sausage. It’s very tasty and has a nice firm, chewy texture. 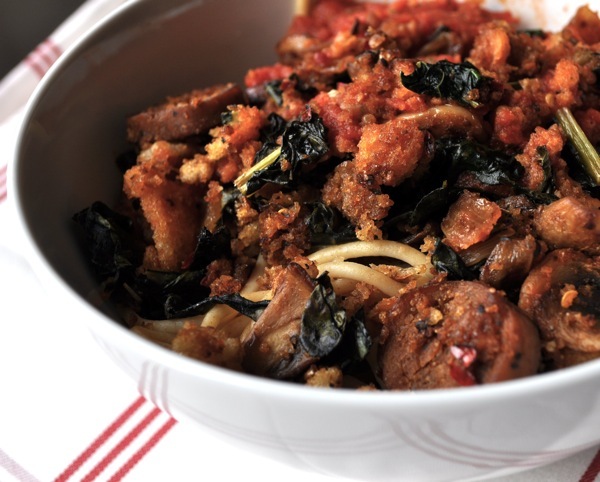 I can’t remember if I ever tasted real sausage in my meat-eating days (it’s been over 15 years), but I think it tastes pretty “meaty.” I think it would mix very well with kale and I have used it in pasta before with great success. I’ll have to try out those garlicky breadcrumbs…yum! @Shirin – We usually get the Italian Sausage flavor too. Just tried Field Roast Grain veggie sausages for the first time last week. They are a little meatier looking than Tofurkey brand (if that’s possible). We had the Italian flavored variety – spiced nicely with fennel, garlic and eggplant. thanks for introducing veggie sausage to me. I did not know that this was available. I ending up making whole wheat pasta with kale, kalamata olives, garlic, and basil last night. Was out of sight. Been eating a lot of kale lately. Love it. Wife hates it. @raj – no toasted breadcrumbs? This looks so hearty and comforting. The garlicky bread crumbs must add a really nice texture to the dish. Thank you so much for putting out a recipe with kale. I’ve been looking at more ways to include greens such as kale into my diet. I love kale but have run out of ways to make them. I’ve made kale and veg sausage before, but without pasta. But next time I’ll try with pasta to give it some heartiness and make it more into a meal versus side dish. I’d love to see more recipes you can share/create with greens. I don’t cook very often but i recently got some kale because it is so healthy and was looking for an easy recipe. I copped out on the veggie thing and used a pineapple sausage. The rest of the recipe was followed except I bought a red pepper and when I got home my wife told me that was not the same as the recipe. I used it anyway and it was delicious. My wife and daughter both loved it. I can’t wait to finish the leftovers so I can make it again. Thanks for the easy, tasty recipe. PS The toasted crumbs with garlic made a great addition as well. no means understand. It kind of feels too complicated and very extensive for me.